New research shows advertisers’ shift from print only to a hybrid of print-online is continuing to gain momentum after a short period of relative stability. Online ads are ubiquitous, yet the majority of people say they generally ignore ads – even targeted ads. Yet advertisers’ commitment to online advertising is an indication of the medium’s success. Results of research by the Publishers Information Bureau, and the Association of Magazine Media indicates a steep decline in the number of ad pages in news magazines like The Economist, The New Yorker, and Time. “Ad pages” is a measure of the number of pages within a magazine have ads on them. Ad pages are considered to be an accurate measure as compared to ad revenue. 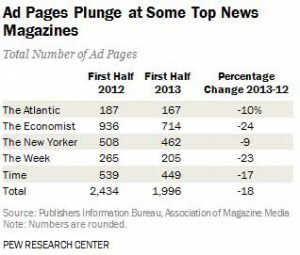 In the first half of 2013, ad pages are down 18% compared to last year and down 13% from 2011 to 2012. So if people ignore online ads, how do websites that run them have any revenue. Speaking from personal experience, small website operators don’t make enough to keep their sites running – the costs of hosting alone aren’t covered by ad revenue. So what is a small website operator? Based on my experience small websites serve under 20 million pages per month. With 20 million pageviews per month a 0.5% response rate translates into 100,000 responses – clicks and possible conversions (a conversion occurs when someone who clicks on an ad actually buys the underlying product or service). A respectable figure. Yet there is some good news: advertising in non-news magazines is healthy. The 2013 Magazine Factbook reports the top 50 marketers spent about $7.7 billion on magazine ads. The top 50 advertisers include Procter & Gamble, L’Oreal, Pfizer, and Time Warner – the top share of the non-internet advertising spend went to cable television; consumer magazines were in third place, after network television.